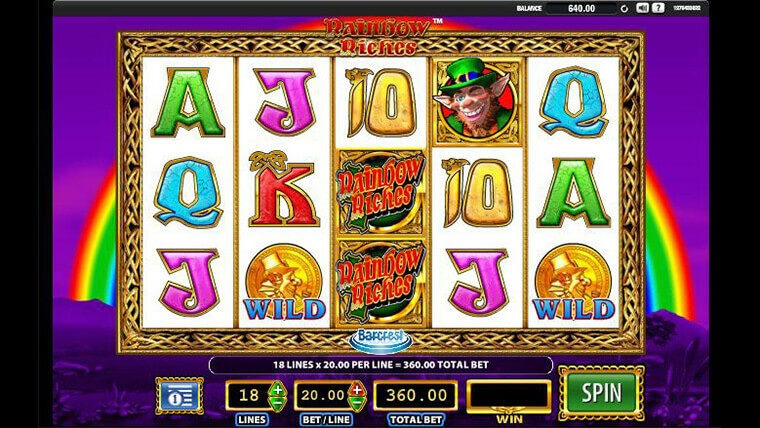 Dive into the golden pot at the end of the rainbow with this Irish themed online video slot provided by Barcrest. Rainbow Riches is part of a series of 8 successful games and is playable only on desktop from a wager as low as €0.01. Join the lucky leprechaun as you spin the 5 reels and 3 rows for a chance to land on one of the 20 paylines. With an RTP of 95.00%, three types of Scatter each with its specially tailored bonus feature and wins of up to 500x the wager, this video slot packs a punch both in terms of gameplay and payouts. Wishing Well Feature – triggered by landing 3 or more Wishing Well Scatters. Select a wishing well and you will be granted prizes of up to 500x your initial bet. Pots of Gold Feature – activated by landing 3 or more Pots of Gold Scatters. A series of bronze, silver and gold pots will spin on the screen and at one point they’ll come to a stop and one will be selected. Prizes during this round are anywhere between 50x to 500x times the total bet. Road to Riches Feature – triggered by 3 or more Road to Riches Scatters. Spin the wheel for prizes anywhere between 1x to 500x.